At Knock Shrine in Co. Mayo in 1879, Our Lady, St. Joseph and St. John the Evangelist appeared at the south gable of the Parish church to 15 people. Two Commissions of Enquiry were subsequently held in 1879 & 1936 to investigate the Apparition. 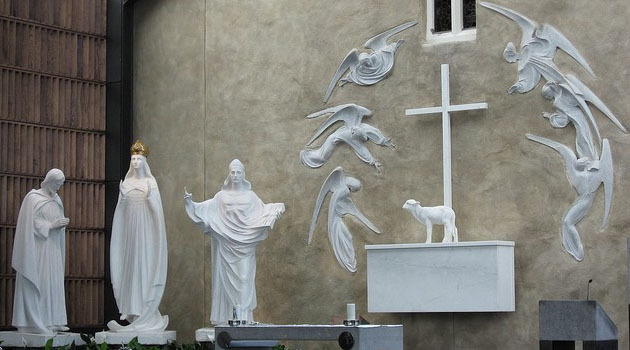 The testimony of these witnesses was found to be trustworthy & satisfactory and this launched Knock Shrine to become renound as one of the world’s leading Marian Shrines. The campus consists of five churches: The Parish Church or Old Church, The Apparition Church, The Basilica, The Blessed Sacrament Chapel and The Chapel of Reconciliation. All of this set on 100 acres of landscaped gardens, with Religious Books Stores, Knock Museum and a Café on site is well equipped to cater for the one and a half million visitors to the Shrine each year. Tubbercurry is located 20 minute drive from Knock Shrine. Please click here for a full programme of devotions. Or visit their facebook page. Travelling by coach or individually, we are an ideal base for a freshly grilled full Irish breakfast or tea and scones in the morning and dinner on your way home, please contact us for more information.